On the 8th of March, with­out prop­er notice to his allies, Trump released 2 pres­i­den­tial procla­ma­tions that increased the tar­iff on all imports of steel and alu­minum into the USA, except­ing Mex­i­co and Cana­da, by 25% and 10% respec­tive­ly. In response to this, on the 18th of May, the Euro­pean Union con­tact­ed the World Trade Orga­ni­za­tion (WTO) to inform them that the EU would be rais­ing tar­iffs on a vari­ety of goods com­ing from the USA. Trump also went after Chi­na “Unit­ed States is tak­ing action to con­front Chi­na over its state-led, mar­ket-dis­tort­ing forced tech­nol­o­gy trans­fers, intel­lec­tu­al prop­er­ty prac­tices, and cyber intru­sions of U.S. com­mer­cial net­works.” The USA imposed a 25% tar­iff on 50bn worth of goods: mak­ing an exten­sive list of tar­get­ed har­mo­niza­tion codes from Chi­na. Chi­na retal­i­at­ed with its own list: rais­ing tar­iffs on 128 US exports into Chi­na worth about 3bn. After that, Trump is now threat­en­ing a sec­ond list “in light of China’s unfair retal­i­a­tion”: rais­ing tar­iffs on 100bn worth of goods. And that’s how this glob­al trade war start­ed. Trade wars have been going on for most of human his­to­ry, and clever busi­ness­es have been find­ing ways around them for just as long. Take the exam­ple of the Ford Tran­sit Con­nect. Ford is an Amer­i­can com­pa­ny but they made this par­tic­u­lar truck in Turkey. 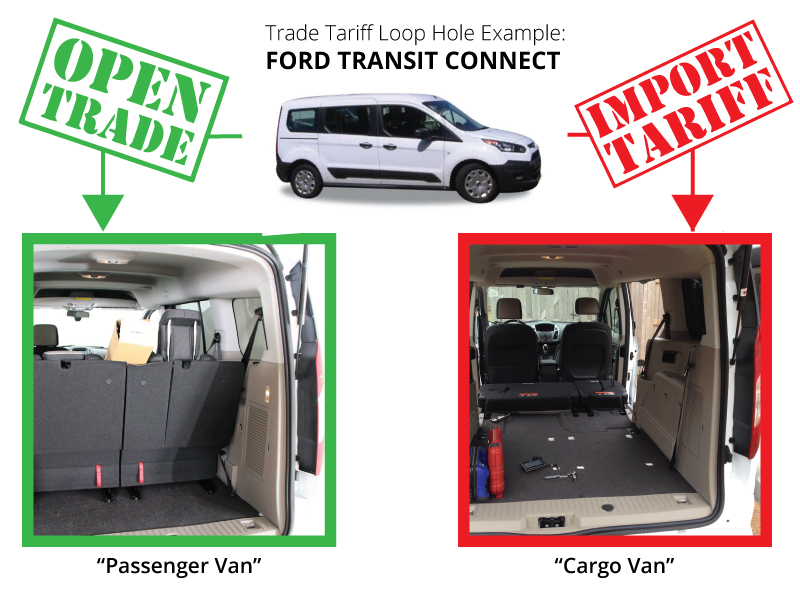 To get around the import tar­iffs placed on car­go vans, Ford would import its vans into the US with seats in the back which let them clas­si­fy them as pas­sen­ger vans and so pay a much low­er tar­iff. Once States-side Ford would then take the seats out and sell them as car­go vans. The trade wars of today are no excep­tion. So how can you get cre­ative with your Har­mo­niza­tion codes to avoid the new tar­iffs? First, you need to find out which of your prod­ucts are affect­ed when import­ing into Chi­na from the USA, into the USA from Chi­na, and into the EU from the USA. Then make an excel sheet using the World Trade Organization’s Tar­iff Down­load Facil­i­ty. Select Chi­na, EU, and the USA for your reporters. Then, select the Har­mo­niza­tion code pre­fix that applies to you. Down­load the Excel file. Now open it and edit it to high­light the har­mo­niza­tion codes affect­ed by the trade war as list­ed in the nation­al tar­iff lists pub­lished respec­tive­ly by Chi­na, the EU, and the USA. Final­ly, look care­ful­ly at high­light­ed har­mo­niza­tion codes and mark down the near­est non-high­light­ed adja­cent codes. These Har­mo­niza­tion num­bers rep­re­sent the clos­ets relat­ed har­mo­niza­tion cat­e­go­ry with­out a tar­iff that you could poten­tial­ly reclas­si­fy your prod­uct under. Depend­ing on the actu­al prod­uct you can now make a case with the par­tic­u­lar nation­al cus­toms office to reclas­si­fy your prod­uct under the har­mo­niza­tion code with the less­er tar­iff. You may have to slight­ly adapt the pack­ag­ing or the prod­uct itself to help it fit bet­ter in this cat­e­go­ry. If you are import­ing Chem­i­cals or plas­tics into the EU from the US and you are a bit lost as what to do and how to adapt to the new tar­iff land­scape then get in con­tact with us. With CAPLINQ’s order ful­fill­ment ser­vices, we help you get cre­ative with your Har­mo­niza­tion codes to find the right loop­holes and the new prod­uct cat­e­gories for your imports. Get in touch with us if you have an urgent ques­tion!